Research with teeth: why do baboons floss? 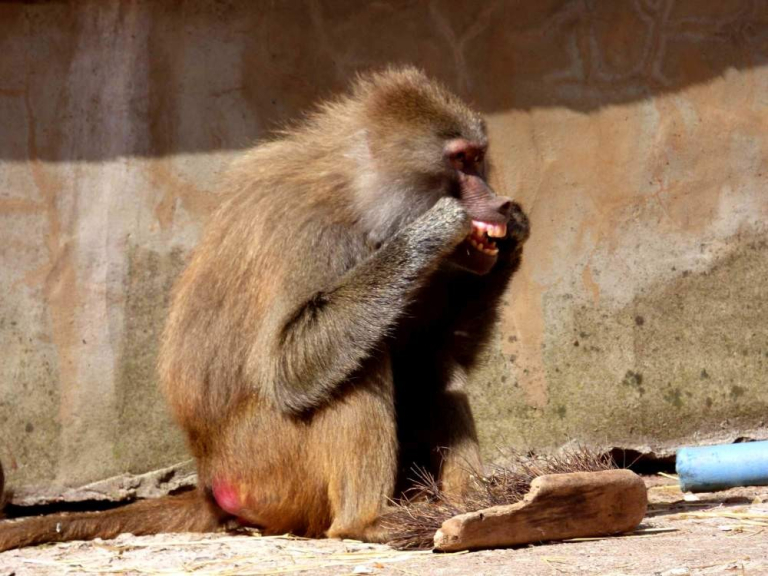 A student from the University of Exeter has observed some surprising behaviour in baboons at Paignton Zoo Environmental Park. Charlotte Morgan, who is studying for an MSc in Animal Behaviour, watched the monkeys flossing their teeth. Charlotte: “Past research at the Zoo found that certain baboons floss using their own hair and bristles from broom heads. I have observed cases where baboons will pluck hair off other baboons to floss, which is pretty exciting! My research project is looking to see if personality is related to dental flossing activity in the troop. “From the results of my study, there does appear to be a relationship between certain personality traits and dental flossing. From what I have observed, they start off by grooming themselves and then they pluck off their own hair and place it between their teeth. With the broom heads they usually play around with them and then pluck the bristles off to floss. Macaques in Thailand are known to use strands of human hair to floss. Paignton Zoo Environmental Park is a registered charity. For more information go to www.paigntonzoo.org.uk or ring 01803 697500.